Merck & Co has licensed a diagnostic from Luminex that will be used in its clinical trials of MK-8931, a candidate treatment for Alzheimer's disease. The companion diagnostic will screen patients for inclusion into clinical trials of MK-8931 - which is one of the lead compounds in a new class of Alzheimer's therapeutics called BACE inhibitors. BACE, or beta-secretase, is an enzyme involved in the conversion of amyloid precursor protein (APP) into amyloid beta, which is deposited as plaques in the brains of patients with Alzheimer's disease. 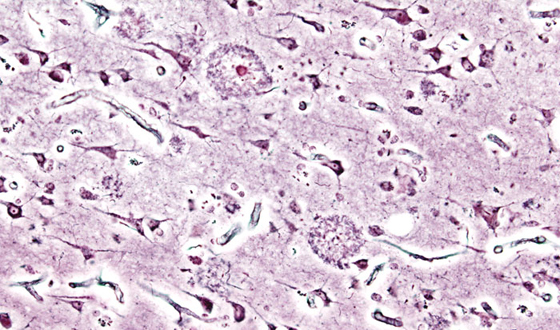 Inhibitors of BACE are designed to interrupt this process, prevent the formation of plaques and - assuming that amyloid formation is central to the development of Alzheimer's - interrupt the cascade of events that lead to degeneration of neurons in the disease. Attempting to block amyloid later in the course of the disease with drugs such as Pfizer's bapineuzumab and Eli Lilly's solanezumab have yielded inconclusive results. Luminex' diagnostic measures levels of two biomarkers - Abeta42 and t-tau - in the cerebrospinal fluid and will be used to identify patients with mild cognitive impairment who are at elevated risk of going on to develop Alzheimer's disease. The two companies said Luminex will be responsible for development, regulatory submission and commercialisation of the diagnostic, although other financial terms have not been disclosed. "Evaluation of biomarkers that may provide an indicator of disease onset and enable earlier diagnosis is an important goal toward facilitating early intervention and potentially improving the treatment of Alzheimer's disease," said Darryle Schoepp, head of neuroscience and ophthalmology at Merck Research Laboratories. Lilly recently won EU approval for Amyvid (florbetapir [18f]), a diagnostic tool that can show the presence or absence of beta-amyoid neuritic plaque density in the brain in patients with cognitive impairment who are being evaluated for Alzheimer's disease and other causes of cognitive decline. It's the first time such a diagnostic has been approved in Europe and Amyvid will also be used to support Lilly's Alzheimer's clinical trials. Merck has advanced MK-8931 into a phase II/III trial called EPOCH on the back of phase I trials showing the drug can reduce beta-amyloid in cerebral spinal fluid by more than 90 per cent with no signs of dose limiting side effects. The company is competing with the likes of Eisai and Lilly whose candidates are slightly further back in development. Eisai reported the first phase I clinical data on its E2609 drug last year, while Lilly recently started phase I/II trials of its LY2886721 compound.